Musings 'n scribblings of a philanthrope .. : Service providers, facilitators and customers .. This chart gives us some of the world's largest service providers. It is an eye opener at the trend of global things that will emerge in the coming years, it also reminds of the great events that befall planet earth and its commercial world in future. All of the service providers mentioned here act as middle-men and have been enabled by the Digital world and e-commerce. These companies have great unparallelled networking capabilities that connect the service provider and the customer . 1. With less of middle men, expenses are less, but often profits are huge. 2 More consolidation and centralisation of money and power. 5. Networking brings more customers and service providers online making the middle-men stronger, more profitable and productive.. The most important lesson this tells us is - the player who has the maximum networking ability is going to control the businesses of the world. 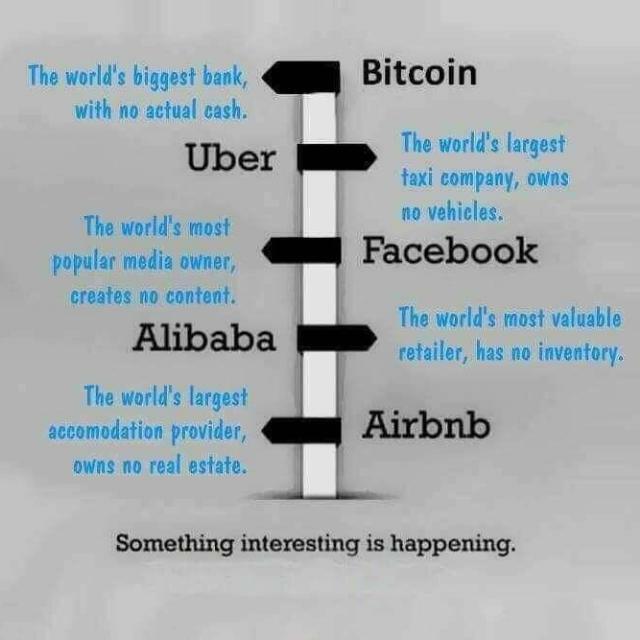 Where will this global trend lead us to ? ?